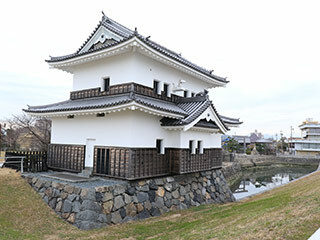 Kuwana Castle (桑名城) is one of the flatland castle located in Kuwana, Mie Prefecture. This castle is also considered as a water floating castle because it is located on the end of a river. This place is also located on Tokaido Road. Today, only moats and bellies are remaining, but you can see the structures of the castle in the early 17th century. 1.use JR Kansai Line to Kuwana Station. Built in: 1601 by Honda Tadakatsu. Kuwana Castle is one of the water floating castle located in Kuwana, Mie Prefecture. This castle is located on Tokaido Road. Therefore, this castle appears in Ukiyoe art of Utagawa Hiroshige. After the battle of Sekigahara, Tokugawa Ieyasu became the top of all Daimyo, and he places his best samurai as a load of this castle. Today, it has only moats and bellies that use the water of the river and sea.